Australian owned & operated luxury travel company Scenic has tonight confirmed its entry into ocean cruising, revealing plans to launch its first vessel in 2018. 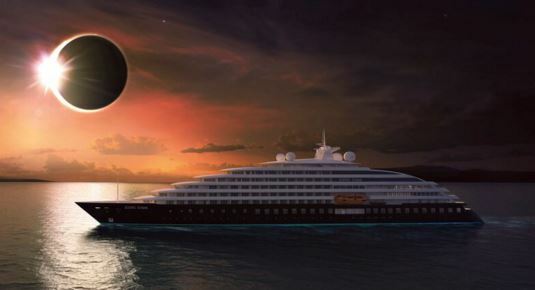 Three years in the planning, Scenic Eclipse is dubbed as the world's first "Discovery Yacht" and will operate over 20 cruise itineraries around the globe. A promotional video for the product describes Scenic Eclipse as "the point in the map where luxury meets discovery". Scenic owner Glen Moroney announced the new ship at a gala event, saying the 16,500-gross tonne vessel takes its inspiration from mega-yachts and elevates ocean cruising to a completely new level in terms of technology and innovation. "It's a whole new step for our company," Moroney said. Scenic Eclipse will feature five restaurants offering guests Pan Asian, Contemporary French and Italian fine-dining options from world-class chefs, four lounges, a spa, spacious public areas, jacuzzis, spas and heated pool with retractable roof. 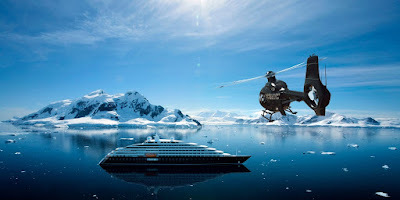 With itineraries covering polar regions, Moroney said the most important element of Scenic Eclipse was the safety and comfort of guests, with the discovery yacht positioned in the Ice Class - 1A Super category - a new benchmark for passenger ships. World-class innovation meets luxury. 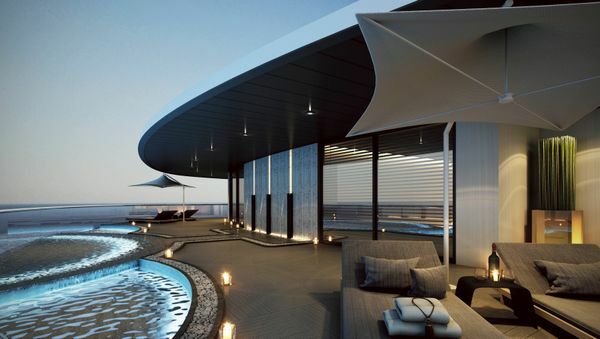 The 6-star ultra-luxury mega yacht for 228 guests features 114 all-verandah suites, from the spacious 32sqm Verandah Suite to the truly luxurious 233sqm two-bedroom Owner’s Penthouse Suite. With intimate guest numbers comes a wealth of public space including a choice of six on board dining options – contemporary fine dining with French cuisine, Pan Asian, Italian and steak to casual al-fresco dining on the Pool Deck or in the Ocean Cafe Lounge. Guests can choose to relax in one of the jacuzzis on the Sun Deck or enjoy a drink with friends in one of spacious bars and lounges on board. The ship also features a 450sqm spa featuring an extensive menu of luxury treatments, indoor and outdoor jacuzzis and plunge pools. The wellness aspect is complemented by a well-equipped gym with a separate yoga and pilates studio. Scenic’s signature brand of all-inclusive luxury means guests will enjoy a superior level of inclusions – all meals (no surcharge for any on board dining venue), complimentary top-shelf beverages all day every day, butler service with an almost 1:1 guest-to-staff ratio and on board entertainment and lectures in the 240 seat theatre. As with all Scenic cruises, all tips and gratuities are included as is complimentary Wi-Fi, expert local guides for included shore excursions, a choice of included Scenic Freechoice activities to personalise the guest experience plus Scenic Enrich special events. The opulent interiors have been designed by Karen Moroney who derived inspiration from a number of the world’s leading luxury hotels. Each suite has been handcrafted to feature the finest in design and fittings, and the public spaces offer an elegant environment to dine and relax. Scenic has not only designed a luxurious Discovery Yacht but it will also be built to the highest safety standard including the latest technological advancements. The ship has been specifically designed to navigate challenging seas in the utmost comfort and safety. Scenic Eclipse will utilise innovative zero speed stabiliser fins, 50 percent larger than standard to provide even greater stability. These sophisticated stabilisers, normally only found on the largest private super yachts, also work when the ship is stationary; adding further to guest comfort. Scenic Eclipse will have the highest passenger ship ice class rating – Polar Class 6 (Ice Class 1A Super), providing an added element of safety for guests. For Arctic and Antarctica cruises, passenger numbers will be limited to 200 which enables a number of landings per day for each guest. 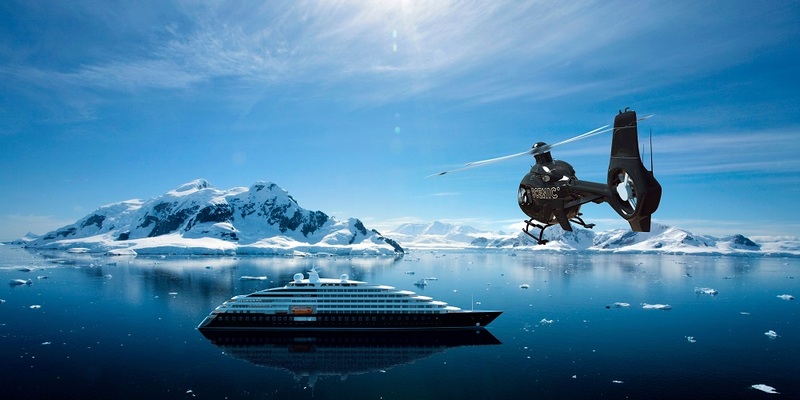 Scenic Eclipse will take guests to places previously thought inaccessible with two on board helicopters and a seven-seat submarine, adding a whole new dimension of wonder. These twin engine helicopters will take guests beyond the horizon whilst the custom-built submarine provides optimal sightseeing to a world below the surface. Our on board Discovery Team is there to help guests experience the very best of these remote regions. Led by experts in their fields, the team will cover a range of subjects and interests plus a full complement of dedicated Antarctic and Arctic team members in these two regions. A fleet of Zodiacs and kayaks are also on board plus scuba diving and snorkelling excursions for in-depth discoveries. Scenic Eclipse has been designed by a collaboration of internal and external naval architects including Foreship in Finland and is being built by Uljanik Group in Croatia. There is the option for a second ship to be delivered in June 2019. Scenic Eclipse joins the Scenic Group’s fleet of 21 river cruise ships throughout Europe, Russia and South East Asia. Speaking at Scenic’s annual Night of Stars trade event in Sydney last night, Chairman Glen Moroney commented: “Our goal with Scenic Eclipse was to open up the private Discovery Yacht experience so that our guests could discover regions previously only visited by a fortunate few.